Hilton Honors continues to offer very popular Gold status fast track offer that requires four stays within 90 day window. Member that sign up for this offer now and complete it in 2019 will have the status through early 2021 per the T&Cs. Note that both paid and award nights count towards the four stay requirement (as long as they are “normal” qualifying stays per the Hilton Honors T&Cs). Hilton Honors recently revamped their website and all the previous Fast Track offers were gone or perhaps under new website addresses. Glad to know that these offers are still around and live. 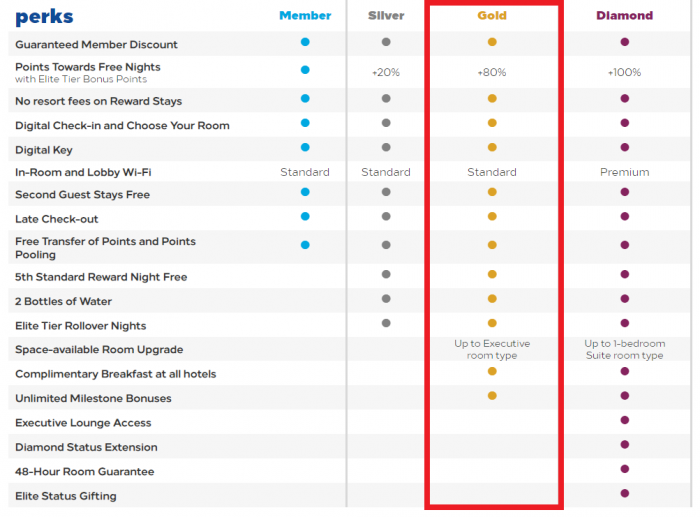 Hilton Honors Gold status is valuable because it comes with complimentary breakfast with all brands (some brands have it for all guests) and space available upgrades. You don’t officially get executive lounge access with Gold status but it does happen occasionally at international properties (outside of the busiest cities). For Gold status, member must complete four qualifying stays within 90 days of registration. Offer available only to travelers of Travel and Transport and is not transferable. Booking should be made through designated online booking tool or approved travel professional. Offer only redeemable once for the lifetime of the promotion.